When people pick careers and get the chance to see it through, they are usually prepared for the vulnerabilities associated with them. Soldiers know, from the very first day, that their job is to serve and defend which will involve risking their lives for the better part of their service years. Lawyers know they have to represent all sort of people and equally embrace carrying derogatory tags and assumptions. Referees? Oh! What could possibly be hazardous about officiating football games? In Europe where football hooliganism is rife and for good reason, underreported, referees can expect death threats from a barrage of emotional, irate supporters after a bad game. In Africa, and particularly in the Nigeria Professional Football League (NPFL), the fans will dish out their frustration on you right at the stadium. It was at an alarming high in the noughties, at this time you don’t need to have a bad game as a referee to save your head. There was a pervasive sense of entitlement that had been ingrained in supporters who saw it as ‘criminal’ and unacceptable for their teams to drop points at home. Referees and traveling teams knew that winning away from home was tantamount to signing one’s death wish. Or unofficial permission to be physically assaulted to the point of dehumanization. “There was an infamous case several years ago when a referee, Dogo Yabilsu, awarded a penalty to Sharks at Kwara United and fans invaded the pitch,” recalls Colin Udoh, one-time editor of kickoffnigeria.com. In another bizarre incidence in 2010, Dolphins’ players were equally intimidated at Kano Pillars. Dolphins were leading 1-0 and as China Acheru, then media officer of the Port Harcourt based side recalled, he could see from his seat, the center referee Gabriel Adigwe signal to the fourth official to add five minutes. “There was a lot of tension building in the stadium already when the match commissioner saw that a win for Dolphins will result in uncontrollable mayhem, he fought his way to stop the fourth official from raising the board. The goal preserved Kano Pillars’ streak until Nasarawa United ended the famous 12-year long streak five years later. Since the start of the 2018/2019 NPFL season, there have been three reports of fans violence; at one time it got out of control in Sagamu where Bethel Nwanesi, the official on the day required stitches to his head. The fans were livid because the official disallowed what looked like a legitimate goal. 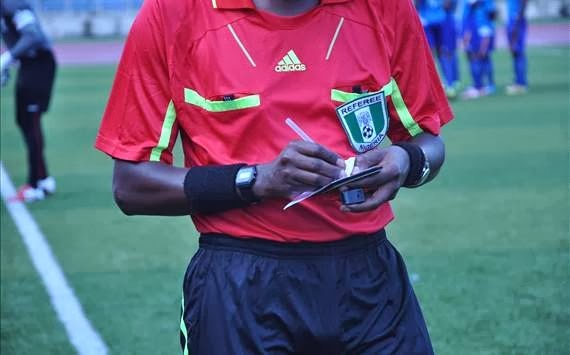 In an industry where referees are regularly accused of taking kickbacks from teams, the perpetrators believed Bethel Nwanesi was biased and had the guts to carry out such acts of injustice on their home turf, hence their uncouth response. The League Management Company’s stance on all of this has been directed solely at match officials, but how has the LMC protected or how will they protect the referees from unruly fans and by extension, the integrity of the game? Simply waving punishment at officials after perceived injustices are one way to address the flagrant delinquencies bedeviling the game, but it won’t rid the sport of hooliganism entirely. Mimisen Iyorhe, a female CAF-badged referee who officiated at AWCON in 2018 has not been pleased with the stance of the LMC either. “It’s easy to issue a communique telling us how many years Refs will be banned when they are involved in issues at games but we never get to see any teams punished for beating Refs. Las las, they’ll pronounce fines that never get to Refs and life goes back to normal.” She wrote on Twitter after the first incidence of the season in Jos involving Sam Agba on matchday one. This time though, clubs have been handed punishments; but these punishments – usually sending the orchestrating teams to a distant venue – does not benefit anyone. Not the offenders and definitely not the visiting teams either who will incur extra costs in logistics. One way to end football hooliganism is by growing the league economically. It is proven as the most effective way of curbing hooliganism. There are traditional supporters who are passionate about their teams and willing to go any length just to see their teams dominate. You don’t need to conduct extensive research to see that these demographics have been at the root of major social disturbances. When the Premier League and the Champions League were founded in 1992, they instigated a break between the clubs and their traditional supporters that has, year on year, seen ticket prices rise and the traditional owners of the game, the industrial working class, priced out. One of the major consequence of this decision is the improved financial strength of the clubs and how independent they have become without income from their fans. And because a lot of money is made from TV rights and brand sponsorship, 10 Premier League clubs would have still made a profit at the end of 2017/18 season had nobody attended their games. It is rare and unimaginable that young, successful men with jobs and families go out of their way to start fights on the weekend at football matches that is why the LMC needs to target these new demographics. These decisions may even wrestle football from the state and allow room for economic growth. Until then, “it has become imperative for the leadership of the referees body to once again not only condemn the barbaric act, but also urge football authorities in the country to wade into the matter because the association is on the verge of asking its members to keep away from the league to avoid being killed by desperate club officers and their rampaging supporters,” a statement signed by the Publicity Secretary of the NRA Kelechi Mejuobi.